To say I've been "hounded" by certain people for not finishing this series would be the understatement of a lifetime. To rectify this, I've started watching it again, and will be trying something new here! When I had my first anime blog, I would watch several seasons of shows at once, and review each episode in detail. When I lost my anime blog in a database wipe and resurrected it as a category here, I limited myself to only watching one series at a time, but still blogged about each one in detail. With my current family, work and university commitments, it's becoming increasingly apparent that if I want to spend as much time watching anime as I have before, I can't afford to blog as much about it! Amirite? While all my other blog posts can be written in coffee shops on the train (and most are), it takes a great deal of effort to capture screenshots, wittle them down to half a dozen, compress them, upload them and go about discussing the plot and character development and art and implications and so forth. Ironically, the very activity I credit with nurturing my fascination with anime ended up burning me out! Perhaps it comes part and parcel with being a developer, but I crave consistency and structure (even if what I'm structuring is my own fractured, poorly constructed prose) but when these impulses result in impeding the very activity they're supposed be supporting, they're self destructive and ultimately pointless! In light of this, I've decided to try something new. When I start watching a series, I'll be discussing it here, but I'll be limiting myself to a few observations. How I end up doing this I haven't decided yet. Bullet points? Hey, I just made a Gurren Lagann related pun. Or is it just a Yoko pun, I'm pretty sure Simon doesn't have a gun. Or at least he doesn't have one yet where I'm up to. But I digress. The irony hasn't escaped me that I've spent paragraphs discussing how I'll be discussing things less, but I hope at least now you'll understand where I'm coming from. I know from the email and tweets I've received that this is overwhelmingly everyone's favourite topic here on Rubenerd.com, so I wanted to do it justice. I hope by reducing the amount I discuss each series, I'll be able to cover more! Thank you all for your support! 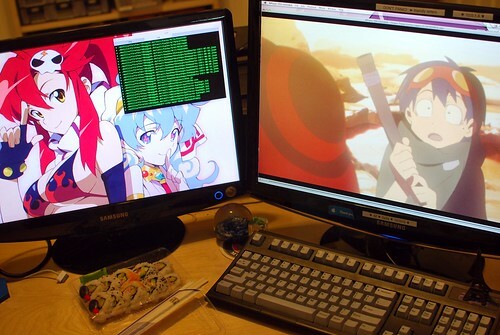 Look out for my Gurren Lagann posts in the coming weeks, as I said in the top of the post, several people have recommended this series to me and more than one friend has vented their anger and/or frustration over the fact I haven't watched more than a few episodes! Older post → Now it violates the GPL? Where does this stop?